Bearberry (Arctostaphylos Uva Ursi) other names: Arberry, Arbousier, Arbousier Traînant, Arbutus uva-ursi, Arctostaphylos uva-ursi, Bearberry, Beargrape, Bearsgrape, Bussserole, Common Bearberry, Faux Buis, Hogberry, Kinnikinnik, Manzanita, Mountain Box, Mountain Cranberry, Petit Buis, Ptarmigan Berry, Raisin de Renard, Raisin d’Ours, Raisin d’Ours Commun, Red Bearberry, Redberry, Rockberry, Sagackhomi, Sandberry, Uva del Oso, Uva Ursi Extract, Uvae Ursi Folium. The uva ursi herb, which is more commonly known as the bearberry is a small and evergreen shrub belonging to the plant order Ericacea. Bearberry is found growing mostly in sandy and gravel rich as well as dry soils, large populations can be found in many parts of continental Europe and in some areas along the northern regions of the continental U.S. - bearberry grows well in dry soils and grows at an optimal rate in soils composed mostly of sand and gravel. Morphologically, the shrub can be distinguished by the presence of a long and solitary fibrous main root that radiates out several buried and prostate stems in different directions, out of these prostate roots, arise the main aerial branching stems of the herb. These aerial stems can often reach four to six inches when they are fully grown. The bearberry has a slightly reddish or brown color bark on the stem. The small leaves of the bearberry are obovate to spatulate in shape and are rounded at the apex, they reach a length of about half an inch to one inch, and the leaves are also characterized by being slightly rolled down at the edges and also by the leathery feel. Bearberry leaves are ideally picked during the fall season. Most of the herbal teas used and marketed in Europe for the herbal treatment of various kidney and urinary bladder disorders contain the bearberry as an active and essential ingredient. These herbal teas are extensively used in many places in Europe for the treatment of renal and bladder problems. When used correctly in different herbal preparations, the bearberry herb can prove to be an effective diuretic and may be used as a general urinary antiseptic. Self-treatment using the bearberry following self-examination of the disorder, depends on the herbal skills of the affected individual-ideally, an herbalist should be consulted even if a patient plans to eventually self-administer the herb for the treatment of simple urinary disorders. Bearberry is used primarily for urinary tract disorders, including infections of the kidney, bladder, and urethra; swelling (inflammation) of the urinary tract; increased urination; painful urination; and urine that contains excess uric acid or other acids. 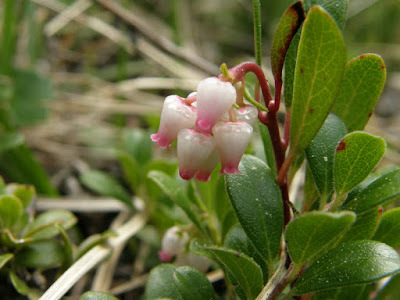 Bearberry is also used for constipation and a lung condition called bronchitis. Bearberry, hops, and peppermint are also used in combination to treat people with compulsive bedwetting and painful urination. The ability of the bearberry to effectively reduce the accumulated levels of uric acid in the body is truly a notable and beneficial power - this beneficial effect of the herb is used in the treatment of many patients affected by urinary system dysfunction leading to the retention of uric acid in the body, and in treating disorders like gout. Inflammation in the urinary bladder is also alleviated by the herbal remedies made from the bearberry; the remedy also alleviates the extreme pain affecting the person as a result of stone formation in the kidney or the urinary bladder. All types of common kidney disorders can be very effectively treated using herbal remedies made from the bearberry or the manzanita herb. The leaves and the berries of bearberry can be used in the preparation of a herbal tea which can effectively help in the treatment of nephritis - which is the inflammation of the kidneys, this tea is also useful in the treatment of renal calculi – which are kidney stones. The herbal tea has also been used in the successful long term treatment of urethritis or inflammation of the urethra in women and in the treatment of cystitis, which is an uncomfortable inflammation affecting the urinary bladder of patients. Such physical disorders seem to be affected greatly by the strong astringent action of the tannin acid present in the berries and the leaves used in the tea - the powerful astringent action of the herbal tea enables the rapid treatment and alleviation of inflammation in internal organs of the urinogenital system. Diseases affecting the kidneys and the urinary bladder are usually treated using the bearberry in the traditional folk medicine of many different European cultures, the bearberry herb has a very effective and strong diuretic action, at the same time it is also a good astringent - both qualities are desirable for the treatment of urinary or renal dysfunction in patients. The bearberry is believed to bring about a very effective antiseptic action on the urinary passages and it is also believed to help in toning the urinogenital system at the same time. Inflammatory disorders of the urinary tract such as cystitis and urethritis are believed to be treatable due to this strong antiseptic and toning effect of the herb. The principal antiseptic and astringent qualities possessed by the bearberry is due to the presence of an organic compound called hydroquinone in the herb, this compound is a chemical hydrolysis product of about five to twelve percent of a main precursor chemical compound called phenolic glycoside arbutin, which is present in the herb. The diuretic action evident in the plant is due to the combined effects of other chemical compounds such as the ursolic acid, which is a triterpene derivative, and a flavonoid pigment compound called isoquercitrin - these compounds together account for the strong diuretic action displayed by the herb. Large amounts of organic compounds called tannins are also present in the bearberry, these compounds may make up to fifteen to twenty percent of the plant extract and as these compounds tend to disturb the digestive process, they are regarded to be undesirable chemical constituents during treatment. The extraction process has to be designed in a particular way to offset the possibility of high tannin content, and for this reason, hot water should not be used to extract the herbal essence from the bearberry leaves - hot water is normally used in the preparation of the herbal tea, resulting in the extraction of high amounts of tannin from the leaves. To avoid this high tannin content tea, the leaves must be soaked in cold water and allowed to stand for twelve to twenty four hours prior to being boiled to make the herbal tea. As a result of this precautionary step, the total tannin content of the boiled beverage can be reduced drastically and the chances of a disrupted digestion can be avoided. Bearberry is possibly safe for most adults when taken by mouth short-term (for up to one month). Bearberry can cause nausea, vomiting, stomach discomfort, and a greenish-brown discoloration of the urine. However, bearberry is possibly unsafe when taken by mouth in high doses or long-term. Bearberry can cause liver damage, eye problems, breathing problems, convulsions, and death. Pregnancy and breast-feeding: Using bearberry during pregnancy is likely unsafe because it might start labor. Not enough is known about the safety of using bearberry during breast-feeding. Avoid use if you are pregnant or nursing. Children: Bearberry is possibly unsafe in children when taken by mouth. Bearberry contains a chemical that might cause severe liver problems. Do not give bearberry to children. Retinal thinning: Bearberry contains a chemical that can thin the retina in the eye. This could worsen the condition of people whose retinas are already too thin. Avoid use if you have this problem.